The sweet aesthetic of Whimsical Floral style brings pastel colors and pretty hand-drawn flowers and leaves together to accentuate the main text. All lettering is in a hand-drawn style. The main text is a whimsical, thin-lined curly script in bright color and is accompanied by a bold serif font in soft colors, with an ultra condensed sans serif for the supporting text. A subtle background texture that looks like a combination of stone and rumpled paper, brings this style together into a charming and sweet expression of who you are. 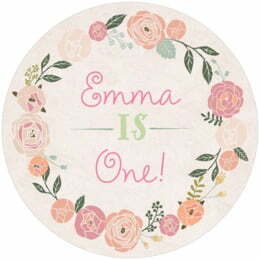 Customize your Whimsical Floral baby birthday coasters today! Whimsical Floral baby birthday coasters come in multiple shapes—3.9" round, 3.9" square with rounded corners, and others. They are extra-thick, 58-point paper board. To give you an idea of how thick they are, a stack of a 12 birthday coasters is about 3/4" tall. They are made of absorbent pulpboard to help protect your tabletop. The coaster surface is coated with a smooth matte coating to provide beautiful, crisp printing. Each coaster is individually die-cut, so their top has a soft and rounded edge. Our baby birthday coasters are designed to be disposable, but they are durable and re-usable. If unused, they can be kept for keepsakes and will keep forever. They are designed to be used at your birthday party; when spilled on, they will absorb liquids as they are designed to do, and it will leave marks on the coasters. Coasters are printed on one side only, and on the blank back, a small Evermine logo is debossed. Baby birthday coasters come beautifully packaged in boxed sets of a dozen. 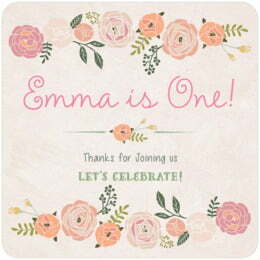 Choose a color, shape, and then select the "Personalize" button to start customizing your Whimsical Floral baby birthday coasters today.